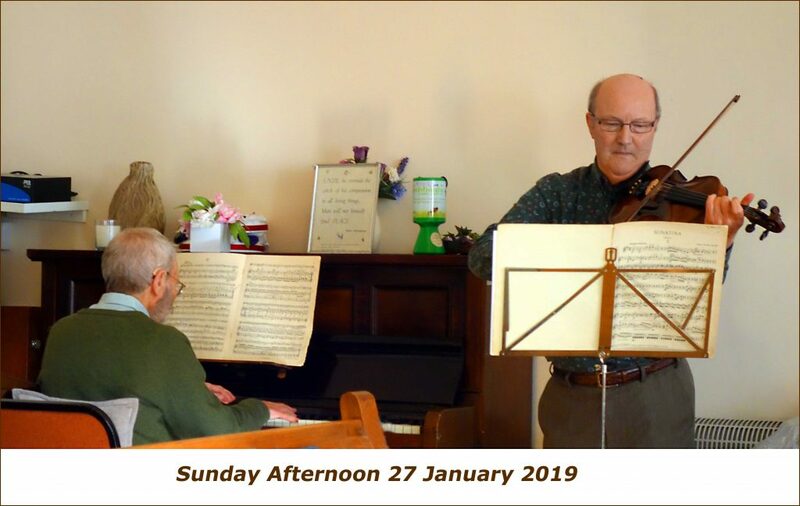 On Sunday 27 January 2019 we held our Christmas party. After the Meeting for Worship there was a delicious bring-and-share lunch, which was followed by a variety of entertainment. This began with an excellent performance of the first and third movements of Dvorak’s Sonatina in G major (Op. 100) for violin and piano, played respectively by Chris and Brian. After this, there was poetry. First, Janet read a seasonal children’s poem, ‘Winter Eyes’ by Douglas Florian, and then, looking more towards spring, the well-known ‘Daffodils’ by William Wordsworth. Elizabeth then read ‘Snowdrops’, a lovely poem that she wrote herself, followed by ‘Down Behind the Dustbin’, an amusing children’s poem by Michael Rosen. The poetry continued with Jill reading her own beautifully inspiring ‘Moon on Snow’. These poems are reprinted below. The afternoon ended with a fiendishly difficult quiz about animals, administered by Sheila, which caused much head-scratching and muttering among the participants; congratulations to Marcia, the clear winner! Mention should also be made of the contributions by Pam and Sue at the end of Meeting for Worship: Pam read from a most interesting magazine article about the significance of snowdrops in relation to the Crimean War, comparable to poppies as a symbol of World War I; and in commemoration of Holocaust Day, Sue read a very moving prayer about forgiveness, found in a concentration camp after World War II (also reprinted below). Throughout the day, the table in the centre of the room was graced by the delightful candle holders made by the Arts & Crafts Group in their January meeting, from jars and bottles covered with multi-coloured tissue paper (see the photos on the website). Many thanks to Elizabeth for organising the event and acting as MC. Once again, on a cold, blustery January afternoon, we were warmed by the generosity of friends in sharing their diverse talents! for a brief moment in time. The moon shining on the snow. Reminds me that we are crystal. Staring through the illusion of time. And it reveals itself in an instant. The spirals unfolding patterns of stories. Allow them to ripple through. Lord, remember not only the men and women of good will, but also those of ill will. But do not remember all the suffering they have inflicted upon us. Remember rather the fruits we have borne, thanks to this suffering: our comradeship, our loyalty, our humility, the courage, the generosity, the greatness of heart that has grown out of all this. And when they come to judgment, let all the fruits we have borne be their forgiveness.